CRESTON, Iowa – Van Lucas flew F-16 fighter jets over Iraq and Afghanistan for the Air National Guard, but the idea of returning to Iowa to fly low-powered crop-dusters several feet off the ground felt like a new level of danger. But in recent years, pilots like Mr. Lucas have encountered a new, rapidly proliferating threat camouflaged among the fields, one that has led to several deaths and, safety officials fear, could cause more. They are thin metal towers, almost 200 feet high, that wind energy companies use to help gather data on the best places to put wind turbines. Mr. Lucas first encountered one of the towers in 2009, as he was spraying fungicide at sundown near a mammoth wind project in Adair, Iowa. Suddenly one of the towers, anchored by a web of guy wires, appeared ahead of him. Towers like these – temporary meteorological evaluation towers, or METs – can be erected in a matter of hours, and at 198 feet high, most barely skirt the 200-foot limit set by the Federal Aviation Administration requiring markings and lighting for safety. At least five people, including three crop-duster pilots, have died after hitting the towers since 2003. Among them was Stephen Allen, a 58-year-old pilot from Walnut Grove, Calif., with 26,000 hours of flying time. In 2011, he was surveying a field for seeding at 150 feet near the town of Oakley when his plane struck a tower, shearing off part of the left wing of the plane and sending it into a nose dive. The National Transportation Safety Board investigated the accident and concluded that Mr. Allen had failed to see the tower, which had no markings for visibility. Mr. Allen’s wife later sued the farmer who leased the land, the company that owned the tower and the tower’s manufacturer. Last month, she received $6.7 million in damages in a settlement. 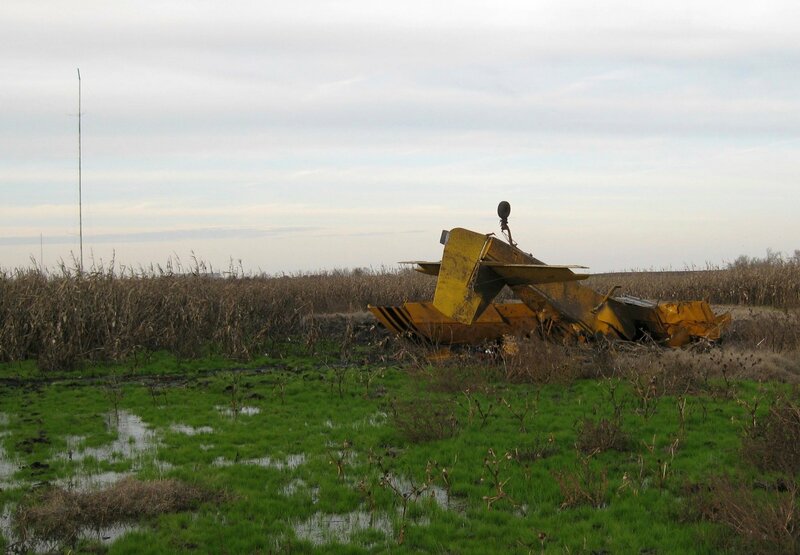 In May, a special investigation by the board identified unmarked evaluation towers as a critical hazard to agricultural planes and other low-flying aircraft, and for the second time urged the F.A.A. to require markings and lighting to improve safety. The board also recommended that a public database be created, containing the GPS coordinates for all such towers – something pilots might refer to before working a field, as they do with beehives and organic farms. While some companies have responded to safety concerns and now paint the towers aviation orange or attach colored balls to the guy wires, the industry in general has resisted recommendations for a public database. “The MET tower is one of the first things you do when pursuing a project, so there are competitive reasons why you wouldn’t want someone to know where you’re putting that project,” said Tom Vinson, vice president for federal regulatory affairs at the American Wind Energy Association, which represents the industry. Mr. Schertz was president of the National Agricultural Aviation Association in 2005, the year a seasoned agricultural pilot based in Texas died after crashing into a MET. Over the years, Mr. Schertz has compiled his own database of over 400 such towers, partly by calling around to wind energy companies and agencies that issue permits. The F.A.A. is still evaluating the safety board’s recommendations, having issued voluntary guidelines to help make the towers more visible a few years ago. In the absence of a federal mandate, nearly a dozen states have passed laws requiring better markings. Even so, adding orange paint has not prevented planes from hitting the towers. On a clear day in 2013, near Balko, Okla., a crop-dusting pilot named Jason Martin, 34, was en route to spray herbicide on a field and flew straight into an orange MET. The impact tore off part of the right wing, and the plane disintegrated upon hitting the ground. A safety board investigation into Mr. Martin’s death concluded that he had not seen the tower because of sun glare. “It’s very, very easy to overlook something, and that’s one of the big reasons that make this business so dangerous,” said Tim Crowell, a pilot working for Schertz Aerial in Illinois. He too had a close brush with a tower, in Nebraska last year. So far this year, no crop-duster pilots have crashed into the towers. Meanwhile, at least seven have died after hitting more familiar obstacles, like power lines and trees. In mid-August, Mr. Lucas flew to southern Minnesota to rescue a soybean farmer from an aphid outbreak. On his second day, while spraying insecticide near a wind farm, he was surprised to find three unmarked METs. The farmer, he said, had given him no warning they were there. With the crop-dusting season wrapping up, Mr. Lucas is starting another project: finding a way to safely use unmanned aerial systems, or drones, to scout for wind turbines and METs. If permitted by the F.A.A. for commercial use, drones could also create further hazards for crop-dusters. KC McGinnis contributed reporting from Indianola, Iowa.